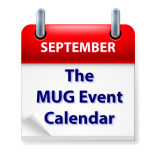 Southern California Macintosh Owners-Users Group – Joe Kissell talks about "The Future of Macs in a Post-PC World"
Capitol Macintosh – Can Health Devices Know Too Much? Letís Make a Photo Book! Macintosh Meeting and Drinking Society – What’s New in iOS 10 and the new iPhones? Maui Apple Users Society – Introducing iOS 10 and the toys that go with it! Los Angeles Creative Pro Users Group – The magical CineXinsert, Cinedeck’s stand-alone, file-to-file insert edit application. Also GoPro Entertainment will be presenting. They will talk about how you can get paid for your best GoPro content through two of GoPro’s latest programs: GoPro Awards and Content Licensing! GoPro will also include an informational session about GoPro’s freelance editor community for those who are interested in editing a variety of GoPro content and want to continue to improve their skill set.